Pozole (pronounced poze-SOLE-eh) is a traditional Mexican soup that I fell in love with the moment I tried it…but just like most really good homemade dishes, this one takes time. And it’s not super healthy. And the most authentic recipes call for pork, usually shoulder and feet. So, traditionalists will probably curse me out (or maybe just scoff) and perhaps even try to prove that my recipe can’t possibly taste as good, but I promise you this recipe tastes as authentic as the real deal. AND it’s a much faster process. Of course it is: I cheated and used a delicious roasted rotisserie chicken and canned hominy instead of dried. fresh chopped cilantro, lime, hot sauce, tortilla chips, shredded cabbage, diced radishes, chopped raw onion. Set about 2 cups of water to boil. While waiting, remove stems and seeds from all the chiles and put them into a bowl. Once the water is boiling, cover the chiles with the water, being sure they are all submerged (you can put a plate on top of them to help). While those are soaking (about 30 minutes), chop the onion and mince the garlic. Drain and rinse the hominy and set aside. 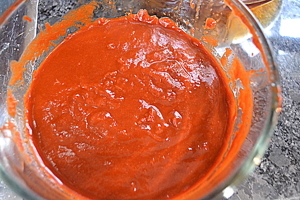 In a blender, combine the softened chiles, 2 tbs. of garlic and about 1 cup of the water from the soaking. Blend mixture until smooth, then pour into and push through a fine mesh strainer into a bowl, removing all the bits of skin from the chiles. If the mixture is too thick, add more water from the soaked chiles. Add the oil to a large pot (dutch oven sized) and set heat to medium. Pour in the onions and stir until slightly softened, then add the remaining garlic. Stir for about 2-3 more minutes, then pour about 2 cups of water into the pot. 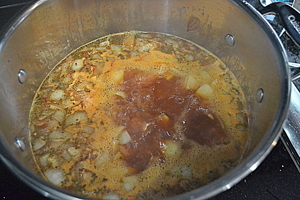 Add the broth, the chile mixture, and all the spices, including salt. Bring to a boil and skim off any foam and fat on the surface. Stir in the hominy and return to a boil, again skimming any foam. Let this simmer for about 30 minutes, then place the chicken into the soup. Simmer, partially covered, for another hour, then serve. You can top with any of the options listed, but our preference is cilantro, lime, hot sauce and chips. If you’d like to try a traditional Pozole recipe, I have found the one in the book Mexico the Beautiful Cookbook by Susanna Palazuelos and Marilyn Tausend to be spot-on (and I love this book for a lot of other really beautiful Mexican dishes with amazing photography). You can find it here on Amazon. 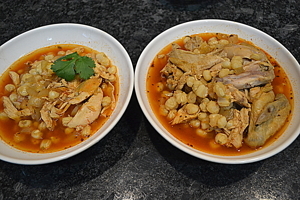 Also note that there are other varieties of pozole (I have made the pozole rojo, or red, version). There is also verde (green) and blanco (white), which have less heat than this version. Don’t be scared to try rojo, though, as it’s not overwhelmingly spicy. Set about 2 cups of water to boil. Remove stems and seeds from all the chiles and put them into a bowl. Cover the chiles with boiling water, being sure they are all submerged and soak for 30 minutes. Blend mixture until smooth, then pour into and push through a fine mesh strainer into a bowl. Add the broth, the chile mixture, and all the spices. Bring to a boil and skim off any foam and fat on the surface. Stir in the hominy and return to a boil, again skimming any foam. 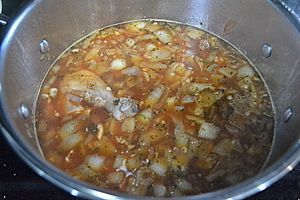 Let this simmer for about 30 minutes, then place the chicken into the soup.